Cooking a pizza in a pizza oven is always a fun experience and results in a great tasting and absolutely delicious pizza. The oven is designed in such a way that the entire pizza enjoys heat evenly and is cooked at a very high temperature which is not achievable with conventional gas or electric ovens. This evenness in heat distribution makes the cooking of food easier than if the source of heat is fan forced from the one direction. This high temperature additionally adds to the dish flavour. For these reasons it is unsurprising that people in Italy where the pizza originated still prefer to cook pizzas in wood fired ovens. What can you cook in a traditional wood fired oven? Almost anything can be cooked in a wood fired oven due to the heat range and retention properties. These include pizza obviously but also bread, stews, chicken, roasts, steak, chestnuts, sun dried tomatoes etc. Delicate things like cakes cannot be cooked in these ovens however due to the precise temperature control that may be needed. Although most people will use pizza ovens solely for the cooking of pizzas, due to the prolonged time they maintain heat they may be used for the cooking of different foods at different intervals. When is the oven hot? It might be hard for you to tell whether your oven is at the right temperature or not. For this purpose, while building an oven, you can install a temperature monitor in the oven. It is a small instrument inside your oven that tells you how hot the temperature inside the oven is. This can help you tell when the oven is hot enough and ready to cook a pizza. To make nice pizzas the temperature need to be around 370 degrees Celsius (700 degrees Fahrenheit). It will take around one to one and a half hours to reach a temperature ready for cooking. You will want to ensure that the temperature around the oven is even and so a longer slower build up of heat is preferable to a large and fast fire. To gauge if the oven is ready to cook pizza you can throw some flour into the oven. Ideally it will turn golden brown and then gradually darken. If this is adequately fast but not too quick the oven is ready. If the flour remains white or only slowly turns yellow the oven is not ready. Pizza needs a very hot oven in order to crisp the bottom rather than turn soggy. If the flour turns black fast the oven is too hot and you should resist adding more wood to the fire to allow the heat to reduce. How hot will the oven get? The maximum temperature of the oven is dependent on the oven size, the design, the materials used, and the thickness of the walls. Generally an oven with a firebrick wall thickness of 5inches (15cm), and cladding of 2inches (5cm), will reach about 370 degrees Celsius (700 degress Fahrenheit) within about 1 - 2 hours. How long will it remain hot? 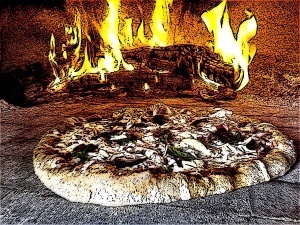 The amount of time a pizza oven remains hot depends on several factors including its size, construction, insulation, cladding, and the material used. A pizza oven can stay hot anywhere from 3-4 days to 90 minutes. Once your oven is built, experiment with it a few times and you will get a good idea about its timings. If you find that the oven is not becoming hot enough of not holding heat for an extended period of time you can always add another layer of insulation and cladding. Now that your pizza oven is ready, it is time for you to make a pizza and see for yourself what everyone means when they say nothing compares to a pizza made in a pizza oven. You might not be successful in your first attempt but keep trying, it takes practice. As the oven will be very hot pizza should only take between one to two minutes to cook. If the oven temperature is not uniform it is possible that one side of the pizza may burn before the others are done. Periodically check that the pizza is cooking evenly and either rotate or move the pizza away from the hottest section. Most pizza recipes are essentially the same with different ingredients and cooking styles. Wood fired oven pizzas are entirely different to the commercial pizza offered by large franchises like Pizza Hut and Dominos. For this reason people unaccustomed to real pizza may be hesitant or skeptical at first. The wonders of a pizza oven also includes the ability to make authentic great tasting bread. Once pizza cooking is complete the oven will usually still be hot enough to bake bread for a period of time. Delicious and fresh bread can be easily baked in a pizza oven. When baking bread you will want to close the oven with a steel or wooden door soaked in water. The water prevents the door from catching fire. 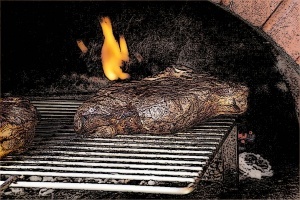 Steak may be cooked in a pizza oven due to the immense heat that is normally generated. Unlike pizza and bread which is placed directly on the fire brick hearthfloor, you will want to utilise a grill to place the steak upon. A grill is a simple metal structure usually made for barbeques. The grill will function much like a bbq while within the oven, however due to the ambient temperature the steak will cook faster. Generally there is little cleaning required with wood fired ovens. Left over food remnants and grease are naturally burnt away from the heat of the fire. Periodic removal of ash and maintenance is usually sufficient. Cleaning chemicals are neither necessary nor is it advised that they ever be used on a wood fired oven. It is possible that such chemicals could be absorbed by the oven, be flammable, or contaminate future food.